Green’s Sausage House not only features a popular restarant, but also a meat market and bakery offering everything from bacon to kolaches. 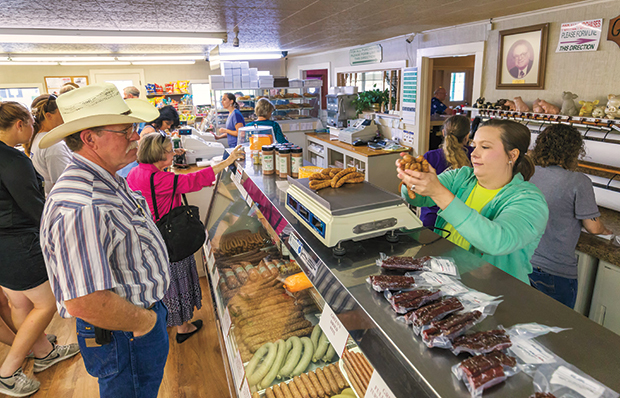 As a light rain falls, a crowd is gathering at Green’s Sausage House, a country café, meat market, and bakery in the tiny Czech community of Zabcikville, 10 miles east of Temple. Breakfast is over at Green’s, and it’s time for lunch. Green’s Sausage House is at 16483 State Highway 53 in Zabcikville, 10 miles east of Temple. Market hours: Mon-Fri 7 a.m.-7 p.m., Sat 7 a.m.-6 p.m. The restaurant closes a half hour before the market does. Green’s dates to 1946, when longtime Zabcikville residents Jerome and Della Green opened a grocery and mercantile to serve the farming communities in their part of the Blackland Prairie. The store soon became known for its delicious sausage, which Jerome made from a Czech recipe handed down from his family. In 1960, with business going strong, Green’s moved across the highway to its present location—a simple building with a long porch that today houses a café, bakery, meat market, and deer processing facility. Sons Charles and Marvin took over in 1984. Green’s Sausage House, surrounded by grain silos, cows, and cornfields, sits just yards from the highway. And by the time I arrive just past 11 a.m. for an early lunch, the front parking lot is full. I find a place in the side lot, make my way past the L-shaped counter at the cash register, and take a seat at a small table near the window. The place reminds me of an old roadside diner. It’s simply furnished with about 10 rectangular tables with vinyl-covered booths along the periphery. Vintage neon signs and metal beer advertisements adorn the walls, but there’s not much else to speak of in the name of décor. The menu offers mostly stick-to-your-ribs fare, including hamburgers, chicken-fried steak, and fried catfish. The spicy boudin balls, beer-battered onion rings, and rib-eye sandwiches are customer favorites. One of the house specialties is something called a kraut sausage burger ($4.79); it’s a grilled sausage patty on a bun with mustard, pickles, onions, and a helping of juicy sauerkraut. That sounds delicious, so I order one with a Shiner Bock and try to be patient. But all decorum vanishes as soon as my burger arrives and I take a bite. The fermented tang of the sauerkraut perfectly complements the sweet and salty flavor of the pork, and the bitter notes of the dark beer play well with the strong personality of the sandwich. In other words, the kraut sausage burger and Shiner Bock are made for each other. By noon the place is packed. A motorcycle club roars into the parking lot, displaying lots of red, white, and blue. Inside, locals socialize at the front tables, under the big Lite Beer sign. A crew of hardhats from the electric company is seated at the counter. My eyes are drawn to a table of elderly farmers who appear to be longtime friends. They are wearing baseball caps and overalls, working their iPhones like millennials as they show off pictures of their great-grandkids. David’s appreciation for Green’s is harder to define. It’s about authenticity. After lunch, I wander over to the meat market and bakery on the west end of the building. Green’s still makes its own sausage, and in a long display case there are more than 20 varieties on display, as well as six kinds of bacon and six kinds of cheese. Jellies, jams, salsas, and specialty items like habanero pickles and pickled quail eggs crowd the shelves at the front, and loaves of homemade bread—some still warm—beckon from another aisle. Green’s bakes a half-dozen kinds of bread on-site, including white ($2.89 per loaf), whole wheat, rye, Italian, jalapeño cheese, and cinnamon nut raisin. The bread sells fast. Moments later I spot the kolache case. With 14 flavors it’s hard to choose, but I select a simple cream cheese variety. I plan to take it with me but yield to temptation before the cashier can make my change. The texture is moist and delicate, and the taste is buttery sweet. It is only when the sun breaks through the clouds and Zabcikville has disappeared from my rearview mirror that I realize the secret to Green’s Sausage House’s success. The food isn’t fast, the building isn’t fancy, and the location isn’t convenient for most people, but Green’s Sausage House offers a snapshot of traditional rural America—and plenty of good food to boot.